Dropbox has announced that it will be shutting down popular email and photo sharing apps Mailbox and Carousel on February 26, 2016 and March 31, 2016 respectively. Dropbox originally acquired Mailbox in March 2013, and launched Carousel in April 2014. The company says it will be communicating directly with users of both apps in the coming days. Mailbox users will no longer be able to sign in starting February 26, and Dropbox will disable and delete "Auto-swipe" patterns, return "Snoozed" emails to inboxes and delete all email drafts on that day. Mailbox has posted a FAQ to assist users with the transition. Carousel timeline photos will remain available in Dropbox, and an export tool will be released early next year to save conversations or shared albums. In the meantime, photos within shared albums can be saved to Dropbox directly from the Carousel app. Carousel has posted a FAQ to help users with the transition. The Carousel and Mailbox teams have built products that are loved by many people and their work will continue to have an impact. We’ll be taking key features from Carousel back to the place where your photos live—in the Dropbox app. We’ll also be using what we’ve learned from Mailbox to build new ways to communicate and collaborate on Dropbox (you can see early signs of this focus with Paper). …As we deepened our focus on collaboration, we realized there’s only so much an email app can do to fundamentally fix email. We’ve come to believe that the best way for us to improve people’s productivity going forward is to streamline the workflows that generate so much email in the first place. When we introduced Carousel in April 2014, we believed a standalone app would be a better way to experience photos. We’re proud to have created a photo app that many of you use and love. However, over the past year and a half, we’ve learned the vast majority of our users prefer the convenience and simplicity of interacting with their photos directly inside of Dropbox. Dropbox users who earned bonus space for using Mailbox or Carousel will retain that storage. Their service is unrivaled though. They should have listened to Jobs when he said they're a feature and not a product. uhhh... and I just started using Mailbox. I really just want a simple mail app like mail.app to work with gmail. Why? Why! Blah. I use an app that's really like Mail.app for that purpose. 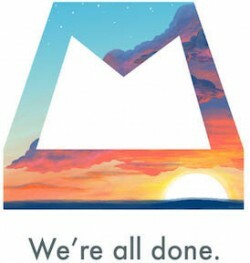 Agreed with above posters - really annoying that Mailbox is shutting down, fundamentally changed the way I use email. Since the Mac beta, it's been my default app, although there's been a lot of grief on the forums in recent weeks as the app has got more buggy with each release - so really, this closure doesn't come as a surprise. FWIW - Spark app on iPhone is a good replacement - more powerful, less minimal. Coming to Mac soon and iPad sooner, have joined their beta program. I think iCloud is killing dropbox with incredible functionality and vastly improved pricing. I don't think Dropbox will be around in a year from now. Inbox is pretty dang close. If only they would add email alias support :( It's a beautiful app though. Their target market is individual users not the enterprise. Most of people don't pay for the extra storage. Their refusal to add tiers between free 2GB and $10/month of 1TB has always been a bad decision IMO. I would have paid for something in the middle.